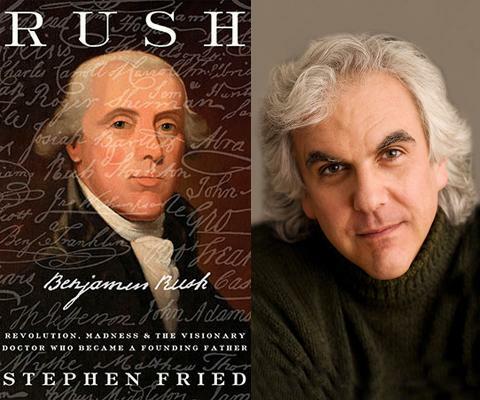 Stephen Fried, lecturer in the Creative Writing Program, launched his new biography, Rush: Revolution, Madness, and Benjamin Rush, the Visionary Doctor Who Became a Founding Father, on September 4, 2018. He has since had events several events in and around Philadelphia, including his September 27 event at The Rosenbach, a not-for-profit museum and library founded in 1954, as a part of their In Conversation With The Rosenbach series. The series focuses on informal, intimate talks given by literary and cultural luminaries that delve into fascinating histories, intellectual curiosities, and inspiring ideas. Stephen Fried will also be holding a book talk at the Mütter Museum on November 8. Stephen Fried is an award-winning journalist and New York Times bestselling author who teaches at Columbia University Graduate School of Journalism and the University of Pennsylvania. He is, most recently, the author of the historical biography Appetite for America, and the coauthor, with Congressman Patrick Kennedy, of A Common Struggle. His earlier books include the biography Thing of Beauty: The Tragedy of Supermodel Gia and the investigative books Bitter Pills and The New Rabbi. A two-time winner of the National Magazine Award, Fried has written frequently for Vanity Fair, GQ, The Washington Post Magazine, Rolling Stone, Glamour, and Philadelphia Magazine. He lives in Philadelphia with his wife, author Diane Ayres.